Boy, does it feel great to be getting ahead of myself in the kitchen! I love being able to grab ingredients, pre-made sides and main dishes from the freezer for a quick throw together meal! And as I look at the coming month, I see whirlwind…my head is already spinning! At the end of September, I have the opportunity to go to New York for a few days on business, and I want to have some easy grabs for Steve in the freezer. Like these mashed potatoes! And the meatloaves I made two weeks ago! What an easy meal for him…take out the night before to thaw in the fridge, and then throw in (or gently place) the microwave or oven to reheat/cook. Mashed Potato Sides – Done! I think that’s about all I can get in this week before we head south for the wedding. How about you?! Are you ahead of yourself in the kitchen yet?! We’re doing some baking tomorrow. I’m planning some Banana and Blueberry Muffins, Apple Cinnamon Pancakes and Blueberry Scones. For the scones, I pat them out and cut them into the classic triangle shape, then flash freeze them unbaked. When you’re to bake them, just add an extra 5 minutes to baking time. They’re so yummy! 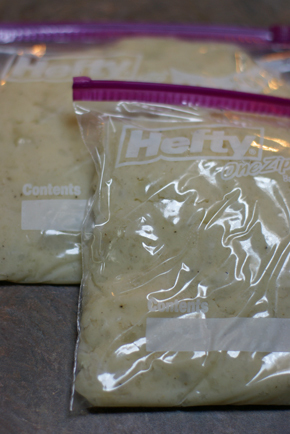 Haven’t had success freezing mashed potatoes—are always watery–any secret tips? Do you do anything special for the mashed potatoes? Or just make them like usual and freeze them? What is the texture like after thawing? @Candi–would you be willing to share your blueberry scone recipe? How do you make the mashed potato sides to freeze good? Make them on the dry side…then add milk when you reheat. That’s what I have found works best! I am also wondering about the mashed potatoes…I’ve never frozen any, but have a huge freezer meal plan brewing (preparing for a baby!) and I want to try mashed potatoes, but heard it can turn out iffy.